Last week I was at the Imperial War Museum for the launch of the Makers of the Modern World series – a massive set of biographies covering all of the main delegates at the Paris Peace Conference of 1919. The Paris Peace Conference was a legendary gathering of the greatest minds of the 20th century, and not just among the diplomats. A young Ernest Hemingway covered the conference as a journalist; Lawrence of Arabia was an adviser to the Arab delegation; even Ho Chi Minh was there, working as a pastry chef while trying to put the case for an independent Indochina. The Makers of the Modern World is proper, posh history (I’ve written the books on the Chinese and Japanese delegates) but talk at the party turned to the Paris Conference in works of fiction and film. The young Indiana Jones, according to Lucasfilm’s chronicles, was working there as an interpreter. A Dangerous Man (1990) starred Ralph Fiennes in what was intended as a semi-sequel to Lawrence of Arabia. And then, of course, there’s My 1919. 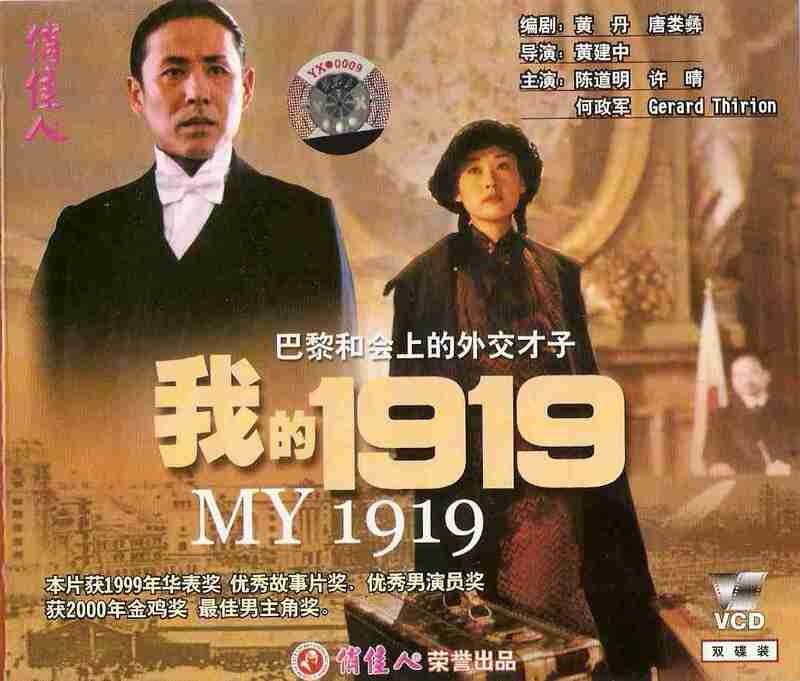 Made in 1999, on the 80th anniversary of the conference, Huang Jianzhong’s film is a very Chinese angle what is usually seen as a European event. It concentrates on Wellington Koo, the dashing young diplomat who pleaded China’s case before a largely uncaring audience, and who boldly refused to sign the Treaty of Versailles when it became clear that the rest of the world had sold the Chinese out. Far from Paris, riots broke out in China over the decision to award Shandong, a sovereign piece of Chinese territory, to the Japanese, even though China had been one of the Allies. The resulting protest in front of the Gate of Heavenly Peace (Tiananmen) in Beijing was arguably the first stirrings of the Communist revolution. It is thus unsurprising that the Chinese saw fit to immortalise the Conference in a worthy educational film, albeit one that has escaped the notice of non-Chinese critics. In a period rich with incident, the filmmakers are unable to resist adding more of their own. Wellington Koo arrives at the Chinese embassy in a wrecked carriage, having been forced to fight off an attack by angry French veterans. He arrives at the same time as Xiao Kejian, a childhood friend who has already rejected the diplomatic path, and is determined to lead a revolution. Kejian seems to have been inserted for political reasons – Koo was a Nationalist, and bitterly opposed the Communist regime that eventually supplanted his own: the script walks a difficult line between both claiming Koo’s victory for China, and admitting that he would not personally have supported today’s Communist regime. Dialogue in the film flips between French and English, Chinese and Japanese – a stab at period accuracy which forever dooms it to displease all audiences equally. Gérard Thirion is a commanding, convincing presence in the role of the French president Georges Clemenceau, but not every part has been cast with such care. The actor playing the British prime minister David Lloyd George has dialogue lifted directly from the conference transcripts, but delivers it all with a bizarre series of Gallic twitches and shrugs and an almost unintelligible European accent – this is not the gruff Welshman of the historical record. The final clash of Wellington Koo and the Japanese Baron Makino gains a little extra business when Makino loses his pocket watch. Wellington Koo produces it with a flourish, and proclaims that Makino has given it to him as a gift. Makino immediately protests and calls Koo a thief, only to realise that he has taken the bait and presented the assembled dignitaries with an allegory of the Japanese grab for sovereign Chinese territory. There are other changes for dramatic effect. In real life, Koo delivered his speeches in perfect English, wowing the crowds with debating skills honed during the completion of his American doctorate. In the film, he speaks in Chinese while an interpreter hisses an English translation off-mic, all the more to ensure that there is more Mandarin for the target audience to hear. The film’s Koo also becomes an object of affection for Jeanne (Sarah Grappin), a pretty French maid who spends much of the film staring dreamily into space, or practising the Chinese for “I love you.” She doesn’t stand a chance, of course, not the least because the real-life Koo had someone else on his mind at the Peace Conference. The historical Koo arrived in Paris as the recently widowed father of two children. His wife May had died only a few months before in the 1918 flu epidemic, and his friends and family were rushing to find a suitable replacement. One soon appeared in the form of young sugar-cane heiress Oei Hui-lan, a pretty overseas Chinese girl who added a touch of glamour to the stuffy Conference proceedings. Whereas the real-life Koo was practically stalking Oei Hui-lan around Paris, wooing her with orchids and chocolates, the pious hero of My 1919 thinks only of his duty to China. This he achieves, in an dramatic re-imagining of real events, by walking up to sign the Treaty of Versailles, only to turn and deliver an impassioned speech about China’s day of sorrow, and refusing to pick up his pen. To a certain extent, this is true to life – the historical Koo refused to sign, but did not show up to harangue the other delegates. He is still remembered as a hero in modern China, both among the remaining Nationalists on Taiwan and the Communists in Beijing. Jonathan Clements is the author of Wellington Koo in the Makers of the Modern World series. This entry was posted in News and tagged A Dangerous Man, Ernest Hemingway, Gerard Thirion, Huang Jianzhong, Imperial War Museum, Jonathan Clements, Lawrence of Arabia, Makers of the Modern World, My 1919, Ralph Fiennes, Sarah Grappin, Schoolgirl Milky Crisis, Wellington Koo by ixarette. Bookmark the permalink.